Sunday will be the last time Minissale's will be open to serve food. They will now focus their energies on the food line and have a chance to relax. Good for them. M and I stopped in Friday for an early dinner. While not all the place was not packed, most of the tables were reserved. By the time we left, the room was more than half full. I honestly can't remember the last time I ate here. Maybe I never did and just thought I had. M's old apartment wasn't too far away from there so he has definitely been there more than I have. 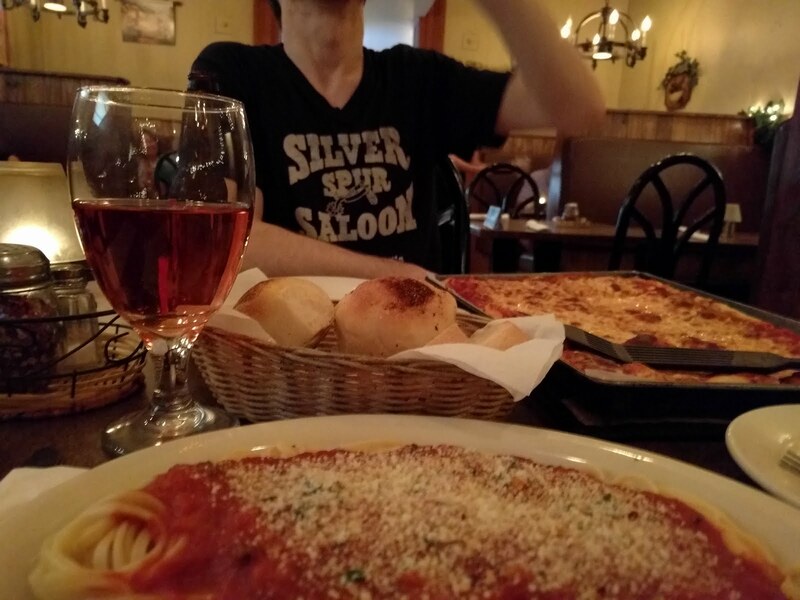 We didn't stay at all from our usual order - pizza and pasta. I also had a cup of pasta e fagioli, which now looking back I should have just went with a salad. Way too warm in there. Really liked the rolls, especially with the oil. And of course when the server set the bread and oil down it reminded me of an article I had read not even an hour before that had said to skip the bread and oil to cut out however many hundred calories. Ate too much bread and brought most of the food home. Devoured everything this morning. Now it's late and I'm home and I miss air conditioning. Fans aren't cutting it.